Rebecca’s practice area is focused on residential real estate, probate, and estate planning. Rebecca closes loans for home purchases, refinance and equity lines as well as residential investment properties. Additionally, Rebecca spends time working with family members when a loved one passes away handling their final affairs and settling of estates. She works with many clients on estate planning including preparation of Wills, Financial Powers of Attorney and Healthcare Power of Attorneys as well as Guardianships. Rebecca grew up in the Lincoln County residing in the Denver area most of her childhood years. She attended East Lincoln High School and completed her high school education at Rocky Mount Academy in Rocky Mount, North Carolina where she met her husband, W. Todd Pomeroy. She attended Salem College in Winston Salem for two years and graduated from the University of North Carolina in Chapel Hill with a Bachelor of Arts degree in Sociology. Prior to law school Rebecca worked in Rocky Mount, North Carolina for the Poyner and Spruill Law Firm. Rebecca attended Cumberland School of Law at Samford University in Birmingham, Alabama, graduating in 1996. In 1996, Rebecca returned to Lincolnton, North Carolina to become a fourth-generation member of the firm and pursue her childhood dream of practicing law with her grandfather, Harvey A. Jonas, Jr. and has remained at the firm for her entire legal career. Rebecca and her husband, the Honorable W. Todd Pomeroy, became partners with the firm in 2000. Rebecca continues as a partner for the firm and her husband left the firm in 2015 after being appointed as a Superior Court Judge for the 27B Judicial District. 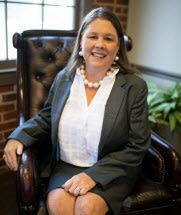 Rebecca has been a member and treasurer for the Lincoln County Bar Association since 1996. Rebecca is also a member of the 27B Bar Association and the North Carolina Bar Association. She is a former member of the Lincolnton Rotary Club, the Downtown Development Program for Lincolnton and the Hospice Board. Rebecca is a former Trustee for First United Methodist Church of Lincolnton where she is a member and was actively involved in setting up the Safe Sanctuary Program for the church. Rebecca is currently the Bar Councilor for the North Carolina State Bar for the 27B district and an outside Board Member with First Federal Savings Bank of Lincolnton. Rebecca and her husband, Todd, were married in law school and have one child, Elijah Jonas Pomeroy. She enjoys spending time with her family and friends, attending her son’s sporting events, being involved in her son’s school, and time at her second home in Blowing Rock.